Our fear about bad storms has always been that we would be without power; once we were without electricity for 5 days. This convinced us to buy an alternator we could attach to our car and at least be able to run critical household items like computer, DSL modem, refrigerator ... and our sump pump. This time, though, we didn't lose power; by the time Hurricane Ernesto blew through Alexandria he had pretty much run out of steam, but we did get a lot of welcome rain. So we went out to the galleries this morning without giving a lot of thought to losing electricity. This time, though, the culprit was not power, it was the sump pump itself. 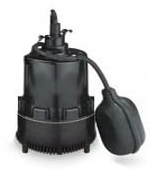 It didn't click on and just hummed when the float switch tipped up when the water level rose in the sum pump's housing. Luckily I have a spare sump pump "just in case." I took off my shoes and socks, rolled up my pants to my knees, and waded in. I detached the old pump, unhooked the feed hose, reattached the new pump, and lowered it into its housing below the basement floor level. I plugged it in. On it came with a pleasant hum and the unwelcome water was on its way out through a series of above and below ground pipes. The moral of the story is: it pays to have a spare available even for those devices you never think will fail.